There’s no substitute for experiencing Evergreen firsthand. On your visit, you can check out Evergreen’s pioneering curriculum and explore our beautiful campus. Come as you are; we encourage everyone to be unapologetically themselves. We’ll show you everything there is to being a Greener. Schedule a visit with us any time of year and experience Evergreen for yourself. Attend an information session and a campus tour. Add a class visit and an overnight stay for an insider’s look at life on campus. For individuals and one or two guests. For schools, community colleges, and other organizations. 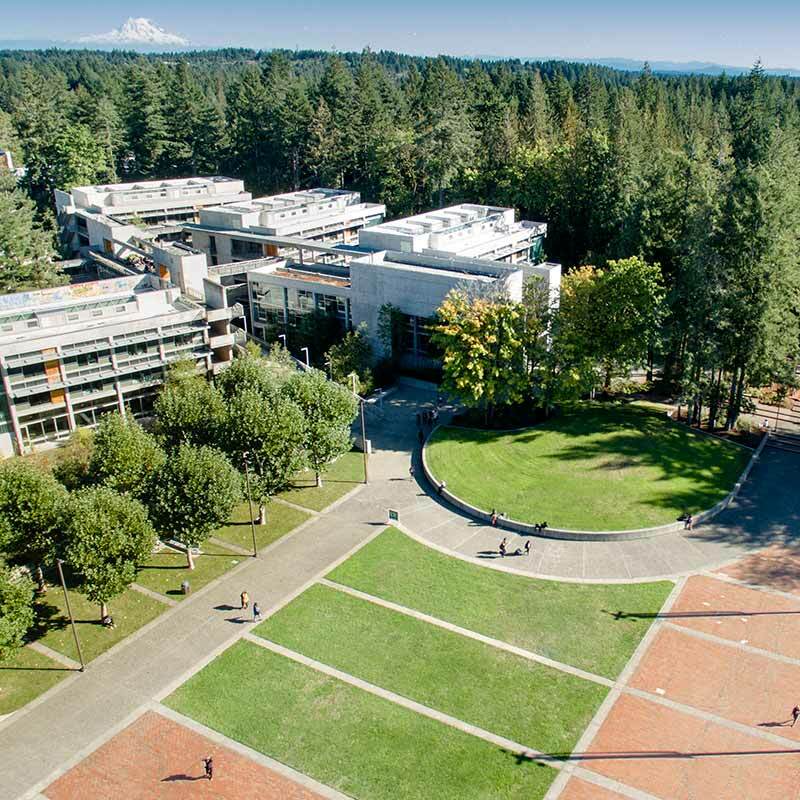 Every visit starts with an information session and campus tour to learn about how Evergreen reinvents education on a daily basis, and why our community feels so warm and supportive. Meet with a Greener guide and other prospective students to see what makes Evergreen unique. Learn how to layer your interests and use narrative evaluations to take the lead in your learning and life beyond college. See the sights in our guided tour and imagine yourself living and learning here. You’ll see the places where you’ll learn and study, live and work out, and you’ll explore other places you can someday make your own. Got a quick question? Drop by Admissions for a 15-minute conversation with an Admissions Counselor. Counselors are available Monday – Friday from 1 pm – 3 pm. Want to see what all the hype is about before stepping on campus? Live half a world away from the Pacific Northwest without a geoduck in sight? We’ve got you covered. Take our virtual campus tour with 360˚ panoramic photos, student profile videos, and an interactive campus map. Available in English, Mandarin, Portuguese, and Spanish. Add a class visit and an overnight stay for an insider’s look at life on campus. This option is not available for group visits. Start with the 10 am information session and you’ll also have time for a class visit with a current student. Please reserve your class visit at least two weeks in advance. Stay in a freshman residence hall, eat dinner with your tour guide, explore our acres of forests and beaches at your own pace. You know, just get the lay of the land. You’ll meet Evergreen students and have a chance to see what Greeners do for fun. (Game night anyone?) During your stay, you can expect to spend the night in either a single-room or a shared room with another student visitor. Please reserve your overnight stay at least two weeks in advance. You must be no older than 20 years old to stay overnight in the residence halls. For individuals and one or two additional guests. Learn more about Evergreen’s distinctive approach to education at one of these half-day events.